Ovi Store and Ovi Publish transitioning to Nokia Store and Nokia Publish. As foretold, Nokia is ditching the Ovi Brand and returning to the more well known “Nokia”. This is going to be a gradual thing that streamlines the Nokia brand, the Nokia image and the Nokia message they give to customers. It was said to begin in July continuing onto 2012, however, we have already seen some related shifts such as Forum Nokia becoming Nokia Developer. 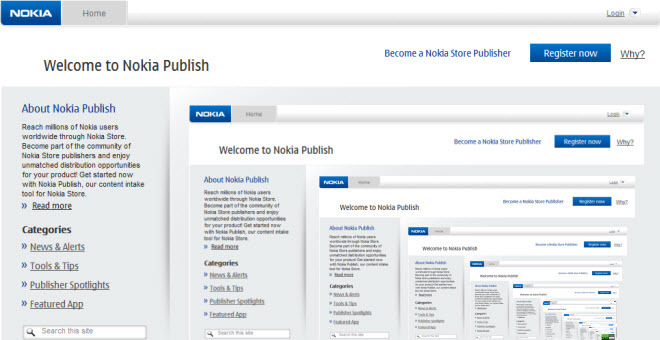 Today we learn Ovi Publish brand is transitioning to Nokia Publish, and of course, Ovi Store becoming Nokia Store. You can see Nokia Store and Nokia Publish mentioned in the screenshots. That’s the landing page, a precursor to the rebranding. Nokia has posted this to transition us into getting used to Ovi Publish being referred to as Ovi Store. « Lankku Live Shot? Nokia N9 spy pic?